I would say my kids are pretty good eaters when it comes to veggies, but sometimes they try to give me a hard time. When they are in one of their protesting-veggie phases, I like to serve them dinners with hidden veggies. I know that everyone must do this w/ spaghetti or soups, but meatloaf is wonderful for this, too. You can add whatever you have on hand and get a great result. We had this for dinner last night, and everyone (unknowingly) ate their veggies. While that is preheating, you can go ahead and prepare your quinoa, according to directions on the package. While the quinoa is cooking, chop up your onion, garlic, and greens. Put all of the ingredients, except for the seasonings, into a large mixing bowl. Once the quinoa is cooked and cooled, add that to your mixing bowl w/ all of the ingredients. At this point, we need to mix to incorporate your ingredients. I like to wash my hands really well and then mix w/ my hands to get everything thoroughly mixed. I suppose you can use a spoon, but I feel it comes better w/ the hands getting in there! Grease a loaf pan w/ ghee or coconut oil. Once everything is mixed well in your mixing bowl, pour everything into the greased loaf pan. Top w/ ketchup (I like to do different swirly designs on top) and sprinkle some thyme and black pepper to taste. Bake for an hour and 15 minutes and enjoy! I would say this serves 6-8, for reference on quantity to prepare. Let me know how you like it if you try it! 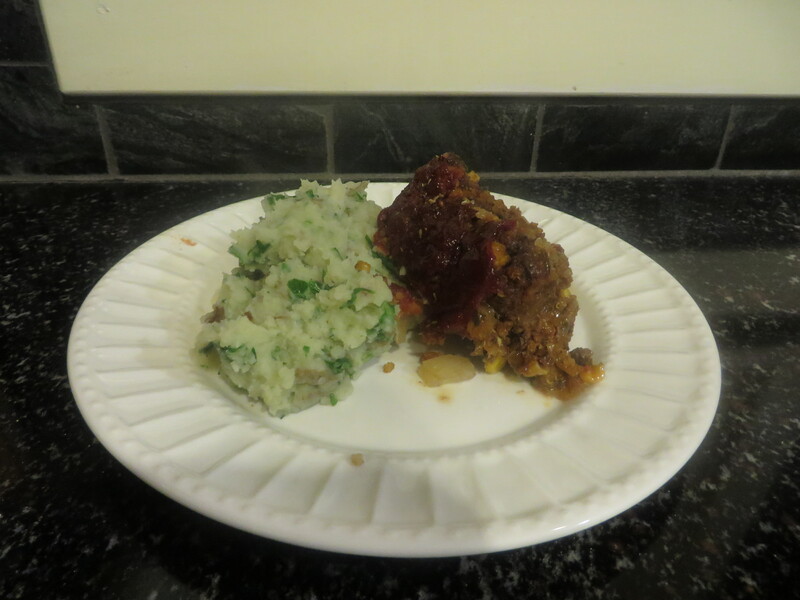 I will create a different post for my Sneaky Mashies that go great w/ this meatloaf in the near future. And after that, maybe I can get back to some sewing! < Previous Trick or Treat? Brussels and Beets!